Methylene Blue is a dye of very low toxicity, deep blue in its oxidized form and colourless when reduced. It has so many applications, it could be called ‘the chemical of a thousand uses’. Further to the left there is a yellow solution of what used to be called potassium ferricyanide, but is now more properly called potassium hexacyanoferrate(III). From an article The Microbial Fuel Cell comes this diagram. The yeast is respiring, with glucose as fuel. Given sufficient heat, the glucose would burn in atmospheric oxygen anyway, but the respiratory system does two things: (1) it is catalytic, and so allows the overall reaction to proceed at lower temperatures, (2) it taps off the energy released to be used for the yeast cell’s own purposes, and in animals for movement and digestion. In this cell, electrons from the methylene blue at a higher potential are passed through an electrical circuit in order to do some work — not much in this case, the motor is there for show rather than doing very much. The overall reaction in this case is glucose being oxidized by the hexacyanoferrate(III), which becomes hexacyanoferrate(II). I suppose that in the process, the yeast is losing much of the value of the glucose. This cell serves only educational purposes, albeit very well — it’s given me insight into things I studied as a student but didn’t grasp well because of a forest of details. The next one perhaps has perhaps less immediate educational value in terms of science studied, but it’s more fun and has a practical application. One goes to one’s nearest pond or lake, retrieves some smelly mud from the bottom (wet garden soil won’t do) and makes these mud cells. Here, in the main part of the diagram, are two connected in series. They are filled with mud from the bottom of the university lake. To see what they are made of, first look at the inset bottom left of picture. E is a carbon fibre electrode, long and thin but with a square paddle hidden at the bottom of the pot. Behind it is a single made up cell, with a red wire coming out of the cathode (positive) and a black wire from the anode (negative)*. However, the working component of these cells is again a microorganism, this time Geobacter. The genus was first discovered in 1987 in the Potomac River, which sticks in my mind as marking the frontier between the Union and Confederate forces in the American Civil War. The species pictured right is the first discovered, G.metallireducens. This is surrounded by a mass of flagella, which enable it to swim and find food. But it also has a few long pili, but originally it was not known what these are for. 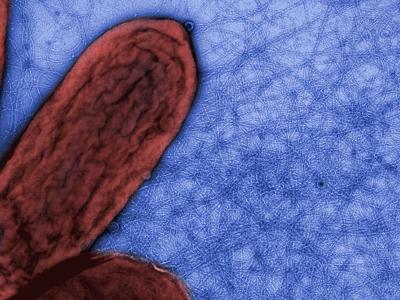 These bacteria are anaerobic, and different species derive their energy by transferring electrons along their respiratory chain to a variety of oxidizers, such as ferric oxide (rust) and uranium. At present the star of the show is Geobacter sulfurreducens, found in 2003 in a soil sample contaminated by hydrocarbons in Oklahoma. It uses organic matter for food, but instead of oxygen can burn its food using among other things sulfur or sulfates, giving rise to smelly hydrogen sulfide. 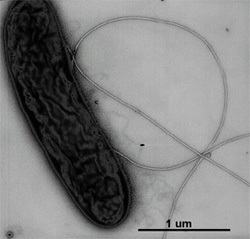 The first major use of Geobacter was seen to be bioremediation, since they can live in all sorts of muck. But G.sulfurreducens can be used in microbial fuel cells that are much more efficient than the yeast cells above. A new strain KN400 might even power batteries attached to turtles to track their migration. This arises because the pili, although made of protein, are conductive like metallic nanowires. Indeed, G.sulfurreducens might even bridge the gap between solid state electronics and biological systems. But back to the cells, particularly the one at top middle of picture. The paddle of the cathode is just under the mud at the top, attached to the electrode shaft by a clip C, while the paddle of the anode is at the bottom, away from oxygen so the bugs can do their work. Such wonderful things in science education these days, perhaps with things like this I might have had a better grasp of many subjects. Kids today — they don’t know when they’re well off! * I used to find the definitions of Cathode and Anode quite confusing. For example, the anode of a battery is the negative terminal, whereas in a vacuum tube the anode or ‘plate’ is positive. Even worse, in a recharging battery, the two terminals swap roles as anode and cathode. The two Wikipedia links just given are helpful for sorting this out. Potential use in supercapacitors, from the Geobacter Project.